There’s a Spider in the Bath! At news time Evie told us a story about finding a spider in her bath. The rest of the children were very excited and shared their stories about finding spiders in funny places. There were spiders in boxes, spiders climbing the walls, spiders behind sofas and even spiders on scooters! We thought about what to do about the spiders we kept finding. 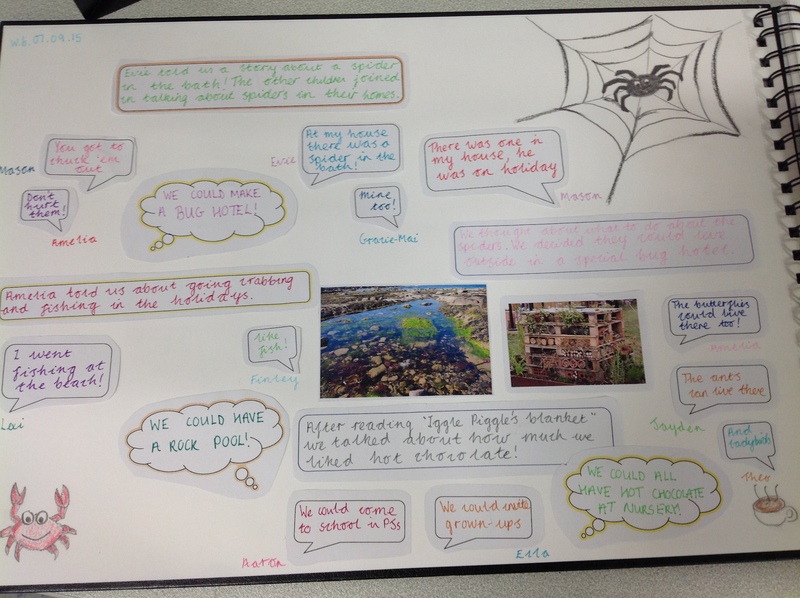 We used our brand new floor book to share our ideas and think about what we could do about all these spiders! Some of the children went to visit the school library and found the story ‘Aargh Spider!’ It is a funny story about a spider who wanted to be a family pet but kept getting sent outside! We thought about making somewhere for the spiders and insects to live outside. We decided to build a bug hotel! To build our bug hotel we used bricks, pallets, logs and branches. First we made the frame of the hotel using the pallets and carefully picking up bricks and placing them in between the pallets. Then we filled the pallets with branches, twigs and leaves for the insects to live in. We added straws and plant pots for bees. Some of the children then found some bugs and put them into the bug hotel. We used magnifying glasses and checklists to see what bugs we could find. Come back soon to see if our insects like their new home!